Through our Project EAT initiative the Junior League of Detroit (JLD) connects food, Education, Access, and Tools to help families eat healthy meals together.The JLD puts its resources into direct service and partnerships to increase the number and breadth of shopping, cooking and eating experiences on the East Side of Detroit, and works to provide well-equipped kitchens and pantries to those in need so they can cook healthy food every day. 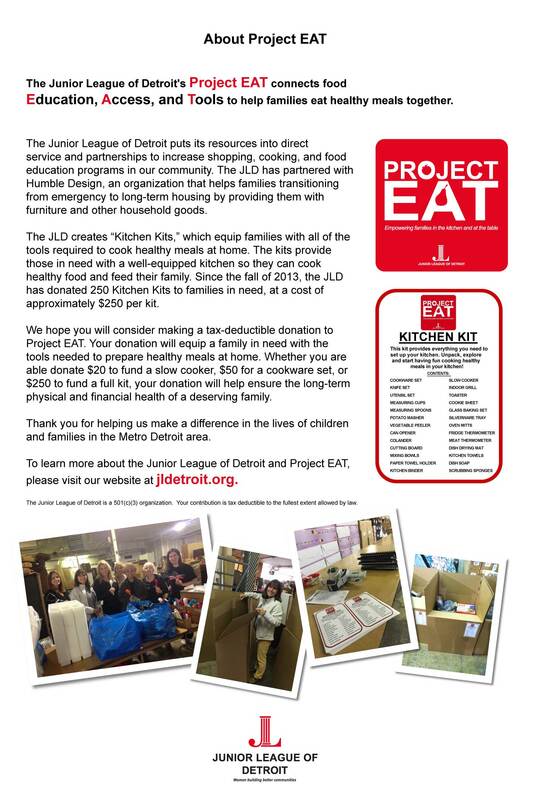 One major part of the project is the Junior League of Detroit’s “Kitchen Kits”, which together with our partner Humble Design provides families with the tools to cook a healthy home cooked meal every day. Food is the most basic of basic needs. By itself, it can’t solve the problems of hunger, obesity or malnutrition. People need to have tools, equipment, and knowledge in order to turn food into nourishment and sustenance. 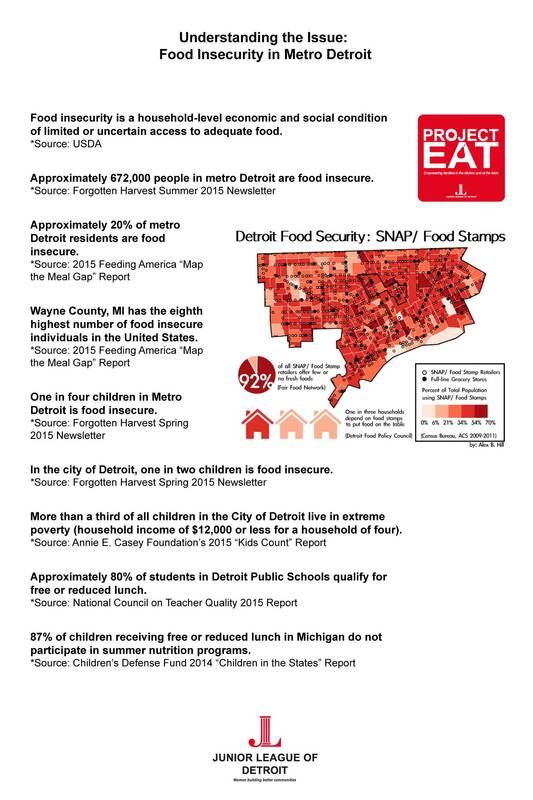 Schools no longer teach the living arts which used to be called “Home Economics” and yet, these are sorely needed by people burdened by poverty, homelessness, food insecurity and illiteracy. 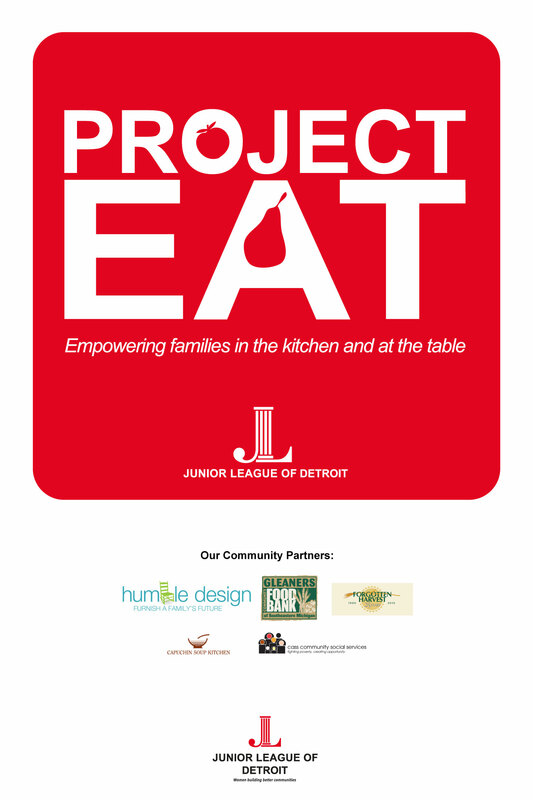 Please help support the Junior League of Detroit and our Project EAT initiative.